The Ramparts, east of Chillagoe, viewed from the track. 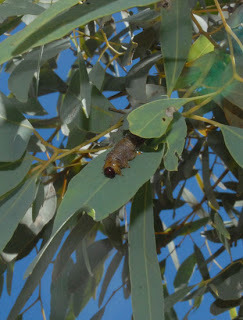 Vegetation around the base includes Cullen's ironbark (Eucalyptus culleni) and a range of shrubs. Vine thicket (a type of dry rainforest) is very vulnerable to fire. Chillagoe limestone weathers into towers and sharp ridges, providing shelter for these susceptible plants. Pergid sawfly larvae are everywhere! 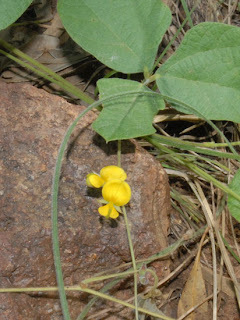 Not much was flowering at Chillagoe, but a couple of pea species were making an effort. This and the following photograph are of Cajanus marmoratus, a creeper related to the upright shrub C. reticulatus photographed in the previous post. 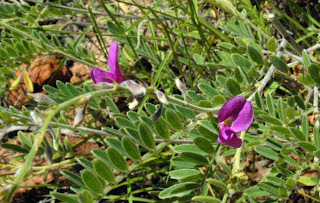 Another native pea, Tephrosia gaudium-solis. This purple gem and the golden Cajanus brightened up the woodland. Glad to hear you're well after all that stormy weather in Queensland. 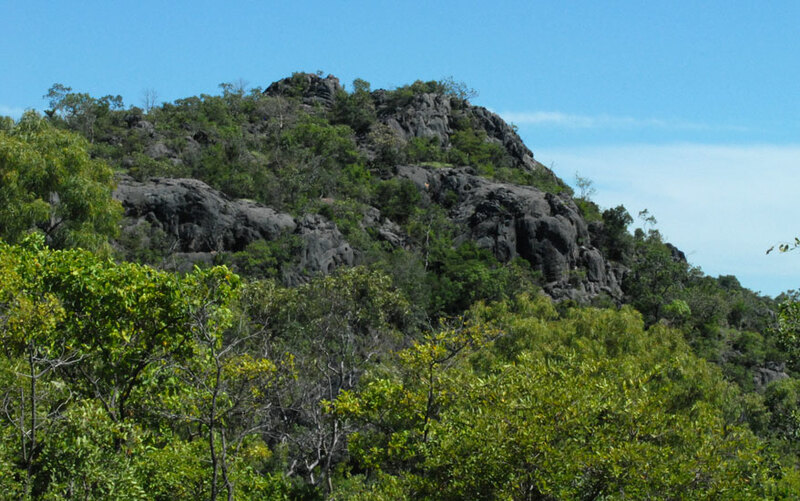 Chillagoe looks interesting from the biogeographical perspective. 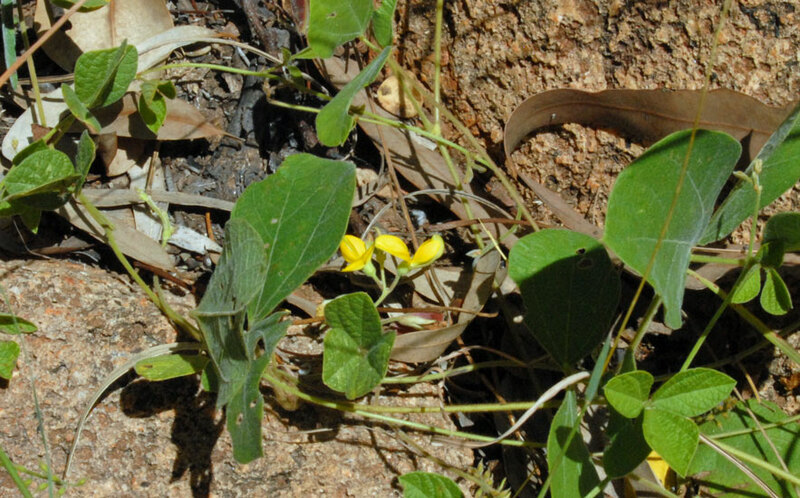 Pardon my ignorance, but are there any endemic plants on Aussie limestone? And by the way, this looks like an area of molluscan interest as well. Australia's Landscape is certainly Powerfilled. From these images the feeling of ancientness emanates for me... the Earthing Energy strong. Have watched Caterpillars doing their migratory thing, but never in such a mass, rolling over each other, carried along Journeying Way. the reading is as enjoyable and interesting as the visuals. 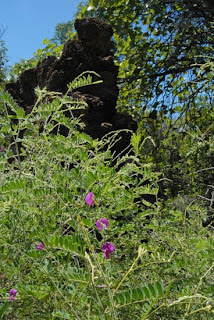 Loved the photos of the peas-especially the purple blooms! Wonderful! Tell me, would you consider that an oxymoron: dry rainforest. The majority of me is being smart-alec but a part of me really does wonder if that would be considered a true oxymoron. Did you collect the Tephrosia for the current revisions going on? and.. all.. that oozing verdantness..
JK, I'm pretty sure that there would be endemic plants, but I can't tell you what they are! I suspect the area has been under-collected. It is definitely an area of molluscan interest, with 25 - 30 species known from the limestone. Some of them are restricted to those few blocks of karst. M, the landscape is really majestic. I love the limestone and the savannah, especially in the Wet, when it's so full of energy. Meggs, dry rainforest (vine thicket) is definitely a bit of an odd term! It occurs in monsoonal areas --- where there's a high annual rainfall but it is markedly seasonal. I wrote a bit about it when I went to Forty Mile Scrub. Neo, it's amazing, isn't it? So green! 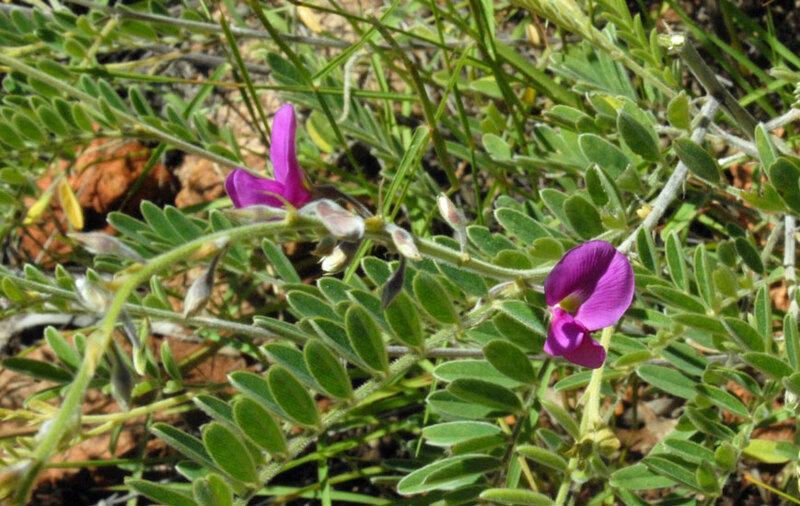 I think the Tephrosia was destined for molecular work. Really, my entire role was taking pics and realising how little I know about plants. a DRY rainforest??? love the little pea flower and purple one also...they look just like plants we have here...same family i guess. 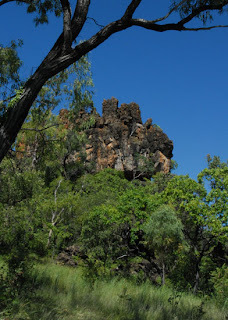 Laura, the rock formations are very picturesque. They come in all shapes, from knife edges to spires to towers and mounds. Can be an absolute you-know-what to walk on, though, when they have been honed by the rain. Definitely need sturdy shoes. And if anyone's as clumsy as me, I'd suggest gardening gloves as well!